Rich pumpkin and cream cheese are spiced just right then topped with a delicious walnut caramel crunch and a touch of warm cinnamon maple butter. Our modern tea-light candles feature a beautiful clear container that allows the candle color to shine through brilliantly, and a self trimming natural fiber wick. Our tea-lights will add a luminous splash of color to any home decor, or any event big or small! Each .5 Oz. 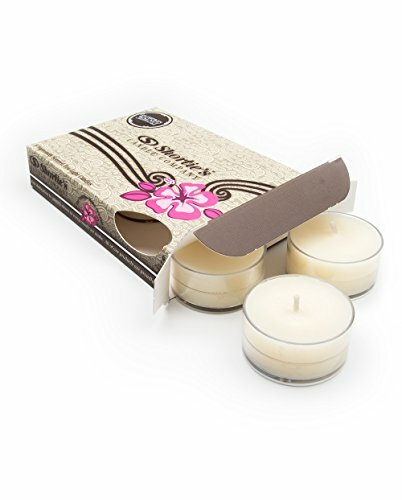 tealight burns for 5+ hours, and pack a great scent throw for such a small package. Our classic container wax is composed of a super soft paraffin petrolatum blend, which allows us to add up to more fragrance to each candle than traditional candles without the fragrance bleeding out. Our classic wax blend also features a low melting point making for a faster melt and better scent throw.